Ole Gunnar Solskjaer‘s success in revitalizing Manchester United after Jose Mourinho's departure has been one of the big stories of the European soccer season, and American keeper Ethan Horvath knows first-hand what kind of coach the Norwegian is. Solskjaer was the coach at Molde when Horvath broke into the first team and led it to the knockout stage of the Europa League in 2016. "His biggest strength is on the field," Horvath said after joining the U.S. national team for its matches against Ecuador and Chile. "He’s a fantastic coach, but he’s also a hands-on coach. He can tell if something is wrong with you, or if you’re in a down moment or something. He’s very hands-on. He’s kind of like a father because he’s a father of three or four so he cares about you like you’re one of his own. I think that’s one of his biggest strengths." Horvath, 23, credits Solskjaer's coaching at Molde for working on his play with his feet -- which U.S. national team coach Gregg Berhalter has stressed is what he wants to see from his goalkeepers. "At my old club in Norway, Molde, with Ole Gunnar, we were playing out of the back a lot," he said. "And at Club Brugge now, we play out of the back almost every time we get. So me previously, I am very comfortable with it, and I think that's good for us as a team, not just myself but the other goalkeepers be good with their feet. It can be an extra bonus for us on the field. If we can build out of the back in certain circumstances, it will help the team." After two seasons at Molde, Horvath moved to Belgium's Club Brugge, where he has spent parts of three seasons. He lost his starting job in the fall of 2017 but started in the last three games of the Belgian playoffs as Club Brugge won the league title. He was back on the bench for the start of the 2018-19 season but has started since a run of three straight shutouts in the UEFA Champions League: 4-0 at Monaco and 0-0 at Borussia Dortmund and 0-0 against Atletico Madrid. "Growing up one of the biggest dreams is to play in Champions League," Horvath said, "and to play the teams I got to play against, Dortmund, Madrid and Monaco, it was fantastic. That’s three massive clubs in Europe so to do as well as I did was a huge confidence [booster]. Now you don’t go out telling yourself to shut out all these clubs, because when you look at the teams we were playing it was kind of like an impossible mission, but when it actually happens it’s a fantastic feeling. To play in the Champions League was kind of like a bucket list check. It was fantastic." 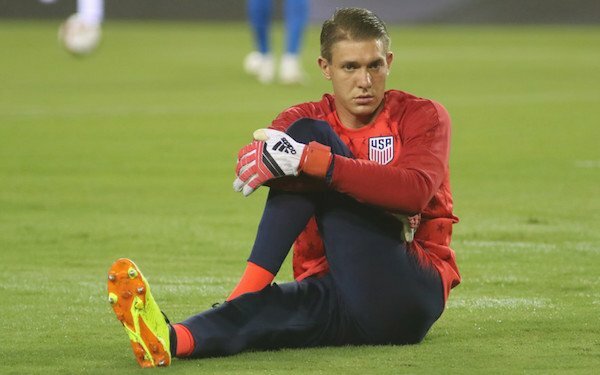 Against Borussia Dortmund, Horvath faced fellow American Christian Pulisic and made a big reaction save on his friend since they broke into the national team at the same time in 2016. "We were messaging on bus ride over," he recalled. "To be a Champions League game at such a high level, it was crazy to play against him. It was an awesome night. I didn't even know it was him until afterwards. After the game, he came to me and said, 'Why did you have to save it?'" Horvath, the only American currently starting in goal for a major club in Europe, will return for the start of the Belgian playoffs, the 10-game series involving the top six teams. "Belgium is a fantastic league, not biggest league in the world but it's a good stepping-stone league. Not just Cub Brugge but there are five or six big teams in Belgium. The league is very competitive. It is very skillful. For any young Americans who want to go over to Europe, Belgium is a very good stepping-stone league before jumping over to a bigger club, say, in Germany or Italy or France or England." Horvath didn't play on Thursday when the USA beat Ecuador, 1-0, but he could get the start on Tuesday against Chile. "Personally I think it’s wide open," Horvath said of the competition in goal. "Brad [Guzan] is not here right now and right now it’s me, Sean [Johnson] and Jesse [Gonzalez]. Zack [Steffen] is obviously in the picture and Brad’s obviously in the picture. I think it’s wide open. All we can do is come into training, and whoever plays the game, just show Gregg and the coaching staff that we are ready." 2 comments about "U.S. keeper Ethan Horvath's European career gets boost from Ole Gunnar Solskjaer". Wooden Ships, March 25, 2019 at 11:02 a.m.
Bob Ashpole, March 25, 2019 at 3:22 p.m.
A sign of the times, although the judgment of what clubs are major is subjective. "Horvath, the only American currently starting in goal for a major club in Europe...."
No one else. And Horvath cannot be said to have been a regular starter for his club yet. My best wishes for success to all US players.